Vireo is a very light and simple boat with lines that make for very surprising performance. A while back I built a dink called WeeVee which was the usual 7-1/2' long. It had a V bottom full length and had to be quite deep in the V to get enough capacity (displacement) to carry anything. I've always thought is was one of the fastest rowing dinks ever built as it would go 4 mph with medium effort, unheard of for such a short boat. But the deep V made for problems, the worst being that it made beaching a challenge. The bottom of the V was 9" below the waterline in usual trim so as you approached the beach the center of the V would ground first usually well before you made the shore. And there you balanced precariously until you threw a foot over the side and got wet. It was OK when launching from a dock, of course, but I seldom do that. Later I found I could heel the boat over when approaching shore and get in a lot closer but it was always tricky. She was a bit tippy but that was no problem once you were seated. So that's how you learn and things evolved quickly into Vireo. Vireo is over 50% longer than WeeVee but is still only 12' long. She has a long lean bow for splitting waves. The V of her bottom is a lot shallower than with WeeVee and although she still needs heeling when beaching, the angle of the heeling is greatly reduced. I think this shape has great potential, perhaps is the fastest of of any simple plywood shape. Here is why I say that. I try to draw these such that at normal weights the chines will not push through the water, that is to say they are normally above the waterline. Only the two bottom panels flow through the water. Those two panels join only at the centerline and in straight motion no water would cross that joint. So the flow is smoothly down two gently curving panels with no joints or complications. In addition, the shape makes for a boat that cuts chop and likes to go straight. But the V bottom means it won't beach as well or be as easy to move around in as a boat with a flat bottom panel. "Yesterday I accomplished a long term goat by rowing from Providence to Newport in a Vireo I built from your plans. This was trip of approximately 26 statute miles which took 6 hours, 12 minutes. I had a little help from a fair tide, but this was still a good time for a long trip made without great physical effort." "I think the Vireo is a good balance of light weight, seaworthiness, and speed. 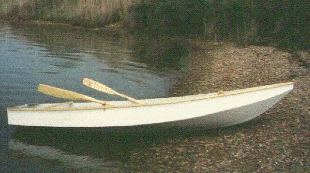 A longer narrower boat would be faster, but would also be less stable and would have less spread at the oarlocks. I built mine from 6mm Okoume plywood with a permanent center rowing thwart. It weighs only 57 pounds and is very easily managed out of the water. I have built several other small boats and this one went together easily in about 30 hours. The plans were very clear." Taped seam construction from three sheets of 1/4" plywood. No jigs or lofting required.